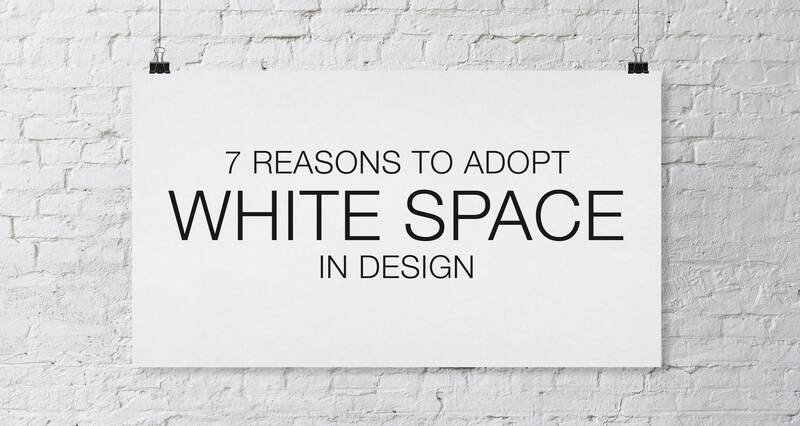 White space is often misunderstood and more often than not viewed as a waste of space. Most designers at an early stage in their career have been requested by clients to fill up the space with more content – feeling they are getting more bang for their buck. When correctly implemented, white space enhances readability, effectively prioritises information, balances design elements, and provides maximum exposure of your brand. White space is commonly known as “negative space”, which refers to the open space between design elements within a design or page layout. These elements include margins, gutters, and spaces between columns, page borders, and lines of text, graphics and images. “Macro” white space specifically refers to the space around and between major elements. “Micro” white space is the space between the smaller elements such as an image and caption, or the space between words. White space is not always just white, it can also consist of areas of colour. Active White Space: Space intentionally left blank for a better structure and layout. It also gives emphasis to the content area. It leads a reader from one element to another. Passive White Space: Empty space around the outside of the page or blank areas inside the content that is the end result of the layout process. Left; Effective use of negative space allows for maximum product exposure. Right; Apple iPod advertising is a prime example of utilising colour as white space. What Does White Space Achieve? When words are surrounded by white space they are more easily read. Knowing how to present your information in hierarchy of importance and in association with white space will ensure the most important message is seen first. The primary reason for incorporating white space is to create visual resting zones that allow the eye to relax and to easily digest information presented. That said, white space used incorrectly have the opposite effect and actually hinder readability. Having no white space creates a jumbled up messy layout that is not only hard to read but also than likely to put people off reading any further. White space is much like an invisible bridge connecting the various elements within a layout. Knowing how much white space to use and where to use it can be trickier than it appears. Balancing design elements in conjunction with white space in a design layout can be a real juggling act for designers early in their career. A strong understanding of the principles associated with the incorporation of white space will allow you to employ the correct amount of white space in the appropriate locations to create a balanced and harmonious layout. An unbalanced and over cluttered layout can be suffocating. The addition of white space between design elements allows the eye to easily navigate between sections of information and other design elements. You only get one chance to grab the attention of your audience’s eye, so it makes sense to get it right the first time. White space allows images to become the drawcard, as they are easily seen from afar. Daily we are bombarded with hundreds, possibly thousands of marketing messages. A simple, uncluttered layout will prove to be more relaxing, pleasing and attractive to the eye and more likely to be read. White space is an integral ingredient in the success of creating visually dynamic and eye-catching creative. Remember the old adage, ‘less is more’. White space is your friend. Don’t allow your design layout to become cram packed like sardines in a can. Are your design layouts smothering your senses and choking your targets audience. Give Chilli a call on (07) 5437 7788 and we can breathe new light into your designs.